If you have played the part of a System Admin in your own home or for a friend, you might have a disk imaging software in your arsenal. Traditionally, it involved using proprietary software like Norton Ghost, Symatc Ghost, etc to ‘ghost’ your machine. 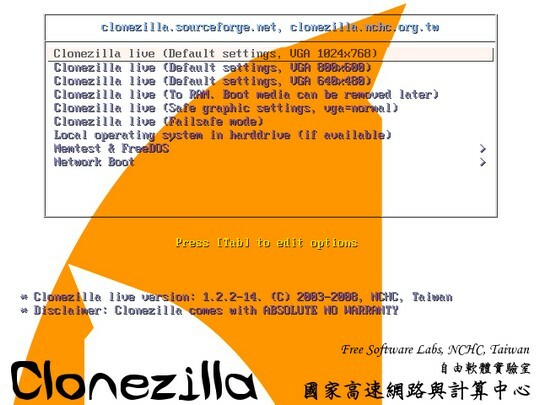 Clonezilla is an open source clone system solution (OCS). Clonezilla is DRBL, Partition Image, ntfsclone, partclone, and udpcast, allows you to do bare metal backup and recovery. Clonezilla is available as Live and SE (server edition). How to Use CloneZilla Live? Just download the Clonezilla ISO file and burn it as a bootable CD/DVD. Then boot the machine you want to clone with this CD/DVD. Check out these step-by-step instructions to see how to create and restore an image. You can also use Clonezilla from a USB flash drive or a usb hard drive. You can also install it on a hard drive with a OS installed already. Even if you aren’t a system admin, you’d hate to see that your hard drive failed. Even if you had a backup of your important data, it’s a pain to get to install and configure all your software like you want. Go ahead and image your hard disk right away with Clonezilla and be prepared for those unpredictable moments! Even if you had a backup of your important data, it is a pain to get to install and configure all your software like you want.